The student team consisted of six OSU civil engineering students: Austin Williams, Alex Furnish, Caleb Lennon, Jessee Bogenoff, Makenzie Budge and Shelby Foley. They worked on all aspects of the project, from the planning stage that started in December 2013, to the construction of the rainwater catchment system in August 2014. The project included analysis of existing geotechnical and rainfall data, design of a wooden structure to support the loads of the water tank, and hydraulic analysis to ensure sufficient elevation to allow water to be gravity-fed for kitchen use. 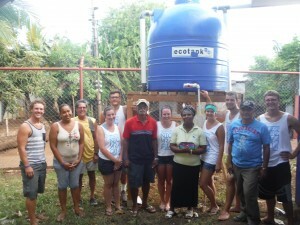 To complete the project, the students collaborated with OSU faculty for guidance and engineering principles, with Little Corn Island community members on the design and construction, and with representatives from the partnering organization GIVE (Growth International Volunteer Excursions) to make the project a success. As a result of this collaborative effort, the standard of living was increased for the residents of Little Corn Island, and the increased supply of fresh water on the island will increase economic sustainability by reducing the need for imported bottled water.